THE REAL HAPPY HOUR WHEN YOUR KIDS ARE ALL ASLEEP AND YOU C - ProudMummy.com the Web's Community for Mums. 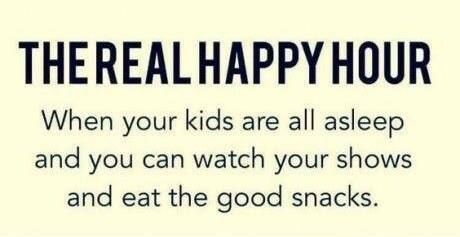 THE REAL HAPPY HOUR WHEN YOUR KIDS ARE ALL ASLEEP AND YOU CAN WATCH YOUR SHOWS AND EAT THE GOOD SNACKS. Sandra Gavigan this is me now!!! Oscar Gray if you can stay awake long enough!